Apparently there’s a winery just two short blocks away from my apartment and I didn’t know about it for the entire year I’ve lived here. I could chalk up my misstep to a lot of various excuses but in my defense it’s a little bit hidden and I’m a tad oblivious at times. Thankfully a post on the LiveSOMA blog alerted me to their existence. Of course, in the interest of full-disclosure, what initially made my visit to Bluxome Street Winery a top priority was the knowledge that a man who sharpened knives would be parked outside their monthly soiree known at the Meet Market. At that point I would have been hard pressed to get any of my knives to cut through butter so I was ecstatic to pack them up and leave them in the hands of Saucy Joe. I figured a glass of wine and some free samples would just be the bonus to convenient sharpening, but I was pleasantly surprised to find out that their wine was astonishingly delicious. 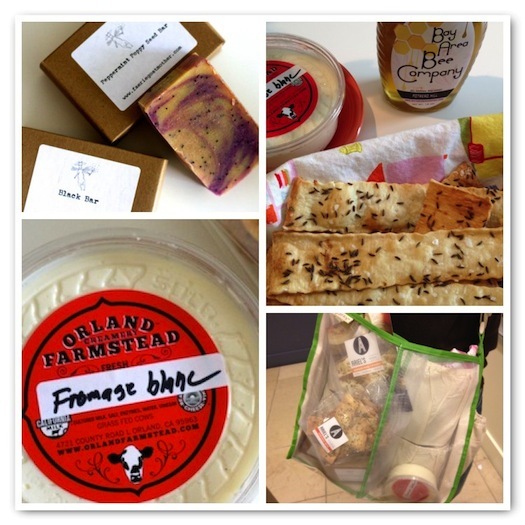 Plus, CK and I discovered a host of new to us local vendors who were selling fantastic products. I felt like I’d stumbled upon edible buried treasure by the time we were through with our visit. I also had a couple of eye opening “wow-you’re-such-a-dolt-Erin” moments. Did you guys know that honey collected from various areas has completely different flavor profiles? 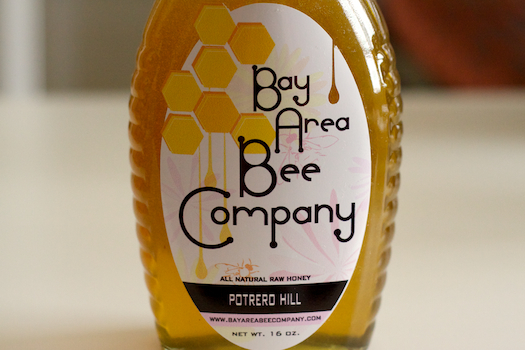 You probably already knew this but I absolutely didn’t and sort of freaked out a bit while doing a honey tasting with the folks from Bay Area Bee Company. After trying a number of samples I decided that the Potrero Hill version was my favorite. This is pretty ironic considering that every Tuesday I despise everything about that area when our Bootcamp class meets there for hill running, but regardless of my distate of steep inclines Potrero sure does produce stellar honey. My other moment of incredulousness occurred at the Ecopia Farms table. First of all the entire area surrounding the greens the team brought smelled like a heavenly field from a fairy tale. Really earthy and fresh, which was a pretty unique experience all on its own, but then they let you taste everything. 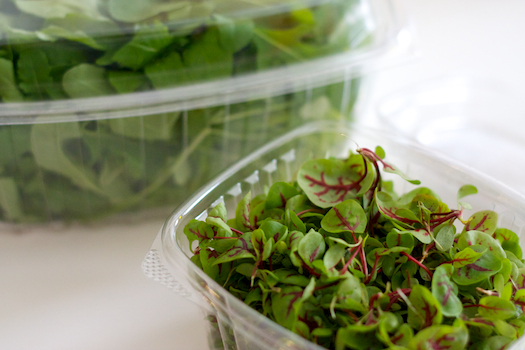 Moments later I fell in love with their Red-Veined Sorrel and promptly had them box some up for me. Have you had sorrel before? This crazy green tastes like it’s already been dressed with vinegar. I could have eaten handfuls. Seriously. In my next life I’m going to request that I come back as a horse that only dines in pastures populated with this plant. Try it! You’ll like it! I also scooped up a package of Ariel’s Caraway Seed Crackers to try with the Orland Creamery Fromage Blanc. Then, I couldn’t help myself when I stumbled upon a woman who called herself The Faerie Goatmother. Best name ever, right? So I ended up with a few bars of her goat’s milk soap. At this point in my impulse shopping extravaganza I was grateful that we had purchased one of Darya Pino’s Mercado bags earlier in the month to cart all of our purchases about. All in all it was a really fun excursion! 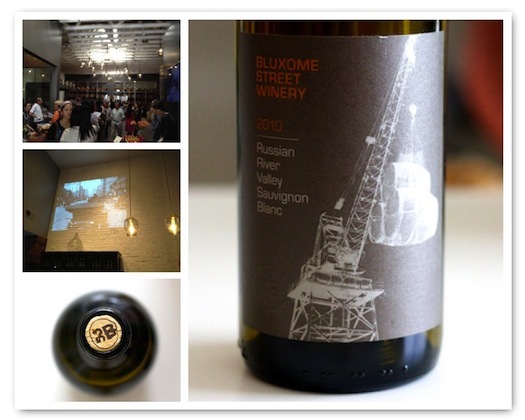 If you want to check it out yourself, Bluxome Street Winery hosts the Meet Market on the last Saturday of the month. I wonder what I’ll find next time? What a fun day! Thanks for sharing your haul with us 🙂 I wish we had something like this out here!